How often do we take the time to really stop and appreciate our surroundings and those around us – family, friends, and strangers? The Social Collective Sukkah is designed to allow the user to take a moment to engage with other people, places, and objects in the surrounding community, through the taking of polaroid pictures and attaching them to the Sukkah. Visitors follow prompts based on colors and image content to take pictures of the surrounding site and fellow visitors which are then attached to corresponding spokes on the structure. These prompts increase the likelihood of social interaction and feed the need for human contact. It encourages people to see their surroundings in new ways that are not just about being the perfect backdrop for a selfie. Moments in time are captured and displayed on the Sukkah which become a physical manifestation of a social media space, viewed collectively, and encouraging opportunities for face to face and out-loud conversations. Formally, the Sukkah design takes on a slanted, hexagonal, geometric shape that can be easily assembled and disassembled in panels. The structure embeds symbols of the holiday into its projected views and the Polaroids produce tactile feathering effects to the exterior and interior walls. Inside, the public can relax, eat, and converse using the integrated benches and tables. 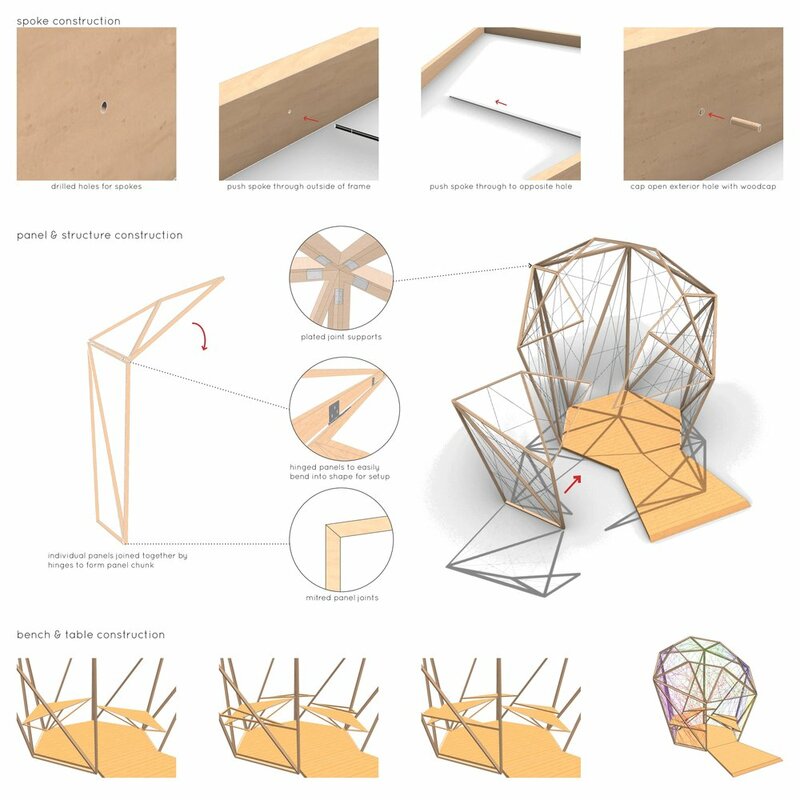 This project attempts to bring the people into contact with one another in ways that can encourage dialogue and creativity within the typology of a structure that has for millennia brought people together to share.